It sounds like something from a science fiction story. But criminals have been stealing rare pieces of meteorite found on this planet for the first time and selling it online. Researchers have called on the public to be vigilant following reports of samples being removed from the site on Skye. Meteorite deposits were recently found at the base of the island’s 60 million-year-old lava sequence and contain mineral material from outer space that has not been found on earth before. One of the locations is An Carnach on the Strathaird peninsula. The unauthorised removal of any of the deposit could be in contravention of the Land Reform (Scotland) Act 2003 and against the law. 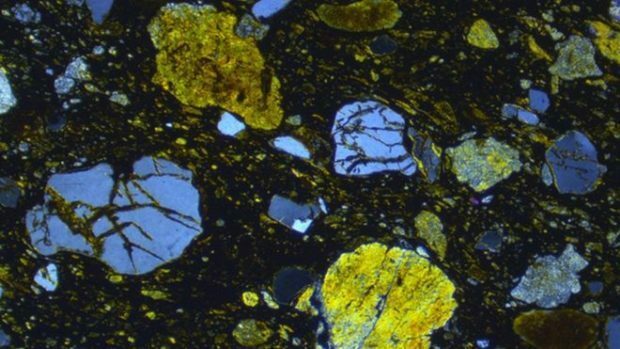 Dr Colin MacFadyen, geologist at Scottish Natural Heritage (SNH) said: “The recent discovery by geologists of meteorite deposits on Skye is yet another example of Scotland’s tremendous geological heritage and its distressing to find out that mineral hunters have been targeting the site. “Reports that samples removed from Skye have been on sale via the internet is extremely concerning and disappointing as we understand that the meteorite deposit is vulnerable to damage and theft. “We are working with the researchers and land owners to safeguard the deposits and ensure they are available for future research. We also appeal to people not to remove any of the deposit which has major scientific importance and help us keep an eye out for those who do. “This is yet another highly significant aspect of Scottish geology – evidence of a catastrophic event from which we could learn a lot in terms of understating the threat to humanity from extra-terrestrial space rock. Dr Simon Drake, from Birkbeck, University of London, made the discovery of the impact site with colleague Dr Andy Beard. They made their find while exploring volcanic rocks. Meteoritic minerals were found below layers of lavas, dated to volcanic activity as much as 61.54 million years ago. While the minerals had not previously been found on Earth, a sample of the same minerals were collected as particles in the wake of comet Wild-2 by Nasa’s Stardust mission in 2006. Dr Drake believes the impact may have played a part in Skye’s volcanological evolution.